Vinpower will introduce new lines and methods of copying and securing content with flash media and hardware at the 2017 CES trade show. 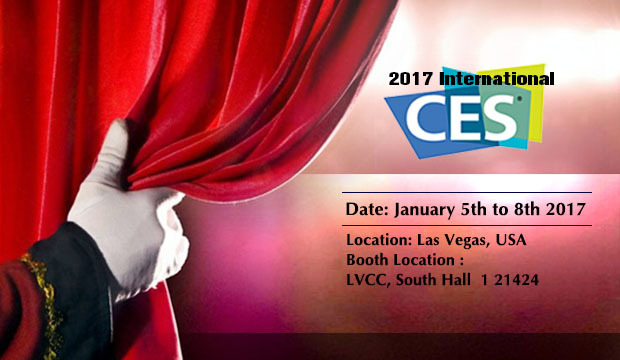 Vinpower will showcase their latest advances in the digital media field during the CES trade show in Las Vegas, NV, the week of January 5th â€“ 8th, 2017. In addition to new and improved products related to optical discs, Vinpower will also showcase prototypes and introduce new ventures in the flash media duplication and encryption market. If you’d like to be one of the first to learn more about these new offerings, you’ll have to visit with us at our booth during the CES show. We look forward to seeing everyone there and for these and many other new opportunities in the New Year! Regardless of which holiday(s) you celebrate, or possibly none at all, in the spirit of good will, Vinpower would like to wish everyone a very Happy Holidays and a Healthy and Prosperous New Year. Vinpower would like to thank everyone that helped contribute to the success of 2016 for us and those we work with. Without the support of our customers, vendors, and friends, we would never have achieved the good fortunes weâ€™ve experienced this past year. Thank you for everything and hereâ€™s to an even greater 2017! 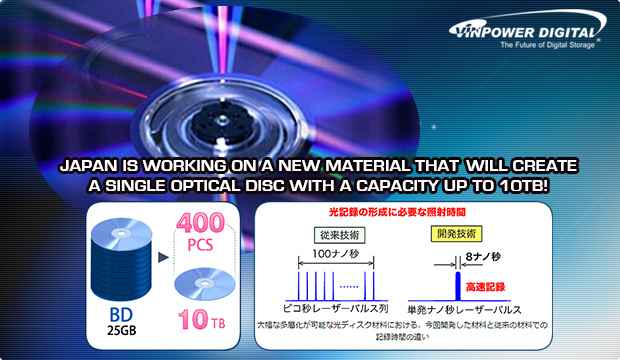 Japan is working on a new material that will create a single optical disc with a capacity up to 10TB! For those of you that donâ€™t read Japanese, like myself, you can use a web browser translator to provide a fairly good translation into your preferred language. The key is that once again, this proves that optical discs are not being completely replaced by streaming, flash media, or even server farms. 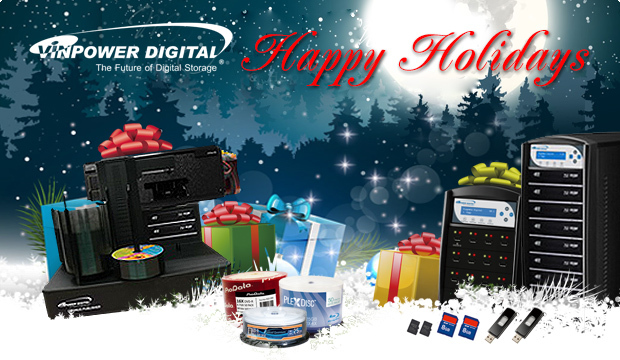 Instead, researchers recognize the value and necessity for both day to day use and long term archival storage that optical discs offer and continue to invest in R&D to develop greater and greater capacity optical discs. Imagine keeping the entire library of congress on a single disc! With so much digitalized information and content that continue to grow exponentially, server farms will become too costly to maintain all that data. It will be critical to have a solution to store important archival data offline, but yet make it easy enough to retrieve if needed at any time. Optical discs remain as necessary and relevant as when they were first created. 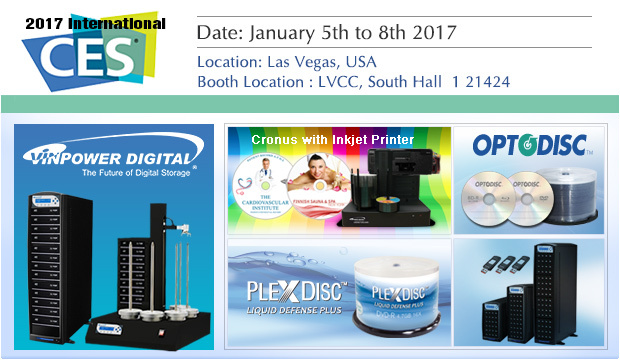 The start of a new calendar year symbolizes the rebirth, especially for the electronics Industry with the arrival of CES (Consumer Electronic Show), which takes place in Las Vegas, NV from Thursday, January 5 through Sunday, January 8, 2017. Once again, Vinpower will be exhibiting at CES in the South Hall 1st level, space # 21424. We will be exhibiting some exciting new product lines that we have recently finalized. However, in order to be among the first to witness these incredible new products, youâ€™ll have to visit us at CES and see them for yourself. Vinpower is very excited about these new offerings and think they will be very popular. Therefore, if you plan to attend the show, please contact us to make an appointment to visit our booth. If you cannot make it, stay tuned for future announcements from Vinpower! All 3 of these elements have to exist simultaneously in order to transition successfully. The only issue is the public hasnâ€™t been as anxious to adopt the latest HD format as they were to transition from analog video tape to the first iteration of digital DVD. For many, they don’t see the benefits of a more vibrant picture and crisper sound. Others, donâ€™t feel it’s worth the added cost to replace their entire entertainment system and movie collection. But eventually the consumers come around. 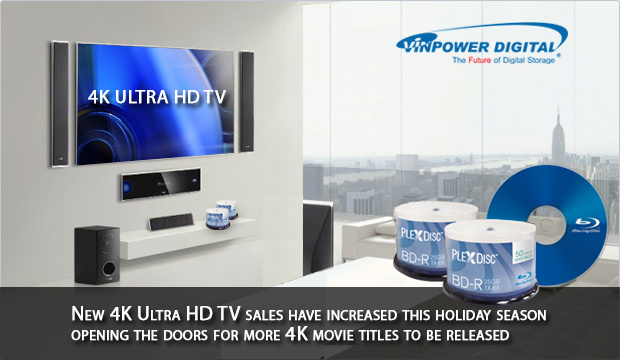 This holiday season, 4K Ultra HD TV’s were a very popular item, especially during the traditional “Black Friday” sales that take place in the US after their Thanksgiving holiday. With the increased 4K TV sales, there will now be more TV’s that can display the brilliance of the 4K resolution and therefore encourage more content producers to create home video titles in 4K as well. This starts the new cycle of adopting a new format into the consumers consciousness and then into the mainstream living rooms. So if you are producing video content, this is a good time to begin upgrading to the 4K Ultra HD format and ride the wave of transition to the new normal.